I hope many of you are off from work today and are able to take some time to think about the brave men and women who are serving and who have served in the armed forces. This is a day to thank them, because they are the reason we live in the country we do. When I was quite young, my father served in the Air Force and later, my husband was also in the Air Force. I was fortunate to have lived over-seas while both my father, and then my husband were stationed in other countries. Our experiences have provided me with many wonderful memories, but I can also remember times when there were political problems in those countries. On Veteran’s Day I reflect on how lucky we are to be living here, and how lucky we are to have men and women who are willing to serve in the armed forces. To me, it’s not just a day off from work, it’s a day of celebration of our freedom and a day for thanks to those whose sacrifices made and continue to make it possible. Thank you to all of the men and women who make our country such a wonderful place to live! 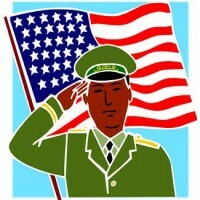 I also want to thank all of the veterans of all wars for their service to our country. Joyce, I think it’s been great how shows like Hallmark’s Home and Family have been highlighting veterans all week. Gratitude to all who have Served. And are Serving. Tessa, you are so right! We wouldn’t be living the way we are if it weren’t for the veterans of today and yesterday. So many wonderful events and ceremonies in the (NY) Capital District today. But on this wonderful sunny, warm Fall day it was the 59 year old parade in Albany for us. I can not remember a year we did not have perfect weather on Veteran’s day (here.) Perfect day to honor our Veteran’s with a parade. And, as always a wonderful turn out. I was at the doctor’s office yesterday and I mentioned that it was Armistice Day. On the 11th day of the 11th month at 11:00 AM the Armistice was signed ending WW !. My father was in France with the Yankee Division on that day. The sweet young thing asked, “Were you here in CT?” I looked at her dumbfounded while my son said that was 1918. “How old do you think my mother is?” Happy Veterans Day and thank you to my father in 1917-1919, my brother in the Navy 1943-1945 and my husband USMC reserves for 35 years. Regina, I’m hoping that the woman who asked you that question wasn’t your doctor or the nurse who was going to be doing something like give you a flu shot!